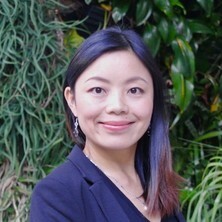 Dr Xiuwen Zhou received her PhD in 2014 from the University of Geneva (Switzerland), where she worked with Prof Tomasz A. Wesolowski. Then she moved to the University of Queensland as a visiting scholar, supported by two awarded fellowships, a Swiss National Science Foundation Early Postdoc Mobility fellowship (2015) and an Australia-APEC Woman in Research Fellowship (2016), hosted by Prof Ben Powell and Prof Paul Burn. Later, she accepted an UQ Development Fellowship in 2017, working as a research fellow at the School of Mathematics and Physics. She was lately awarded an Australia Research Council Discovery Early Research Award commencing in July 2019. Dr Xiuwen Zhou is a theoretician in the interdisciplinary area of physics and chemistry. Her main research interest is to solve problems in chemistry and solid-state physics using physical laws. Her current research focus is to design functional molecules and materials in collaboration with experimentalists (chemists and/or physicists) and other theoreticians (chemists and/or physicists). Her current main research project is on the rational design of light-emitting complexes for organic light-emitting diodes (OLEDs). For more information on available PhD/Honours projects, see https://smp.uq.edu.au/project/modelling-light-emitting-moleculesmaterials . How to choose the frozen density in frozen-density embedding theory-based numerical simulations of local excitations?